Previously we showed that Fugazi had a few songs that they played a lot and a number of songs that they played pretty infrequently. In this post we look at what those songs were. 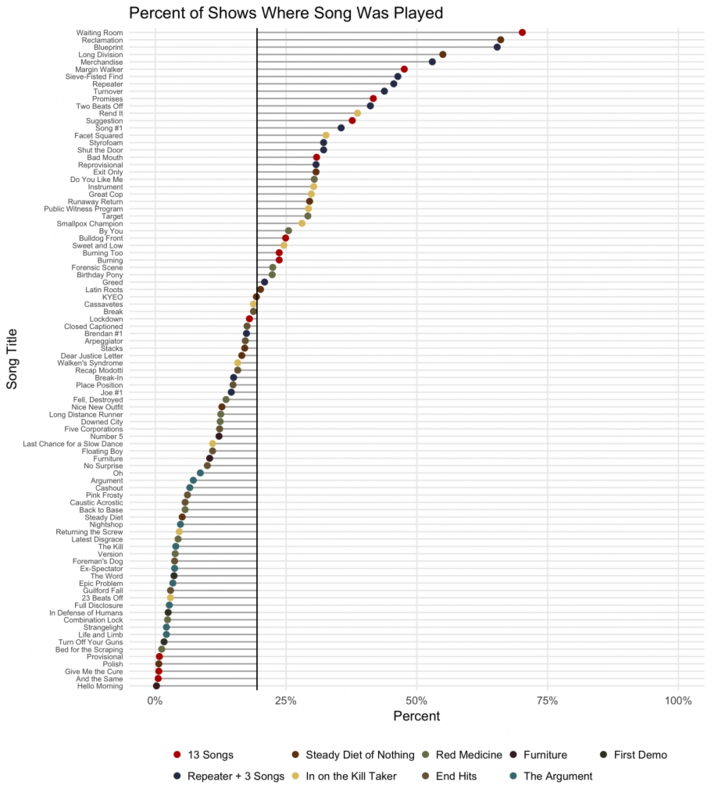 The graph below shows all of Fugazi’s songs, plotted by the percentage of shows where the song was played. I include a vertical line representing the average across all songs (19.4%) and draw drop lines from each point to the average. A couple things are obvious right away. First, it’s really hard to plot this many discrete points. We’ll fix that in a moment. Second, and more to the point, there is clearly a cluster of 14 songs that are played far and away more than others. We zoom in on those songs in the next chart. Within the most played 14 sogs there are five songs that were played in more than 50% of Fugazi’s shows. Three (Blueprint, Reclamation, and Waiting Room) were played in 65% or more of live shows. And one song stands out as their most popular song to play lived: Waiting Room, which was played live in more than 70% of their shows. Indeed the top 14 are dominated by songs from 13 Songs and Repeater +3. This also is not surprising; You can’t play a song live if you haven’t written it. Nevertheless, there definitely seems to be some clustering by album going on here. We’ll take a closer look at that in the next post. If you want, you can listen to the top 14 Fugazi tracks below. During their career, Fugazi released 13 albumns and EPs. Since several of those were later combined (Fugazi and Margin Walker were compiled to become 13 Songs. 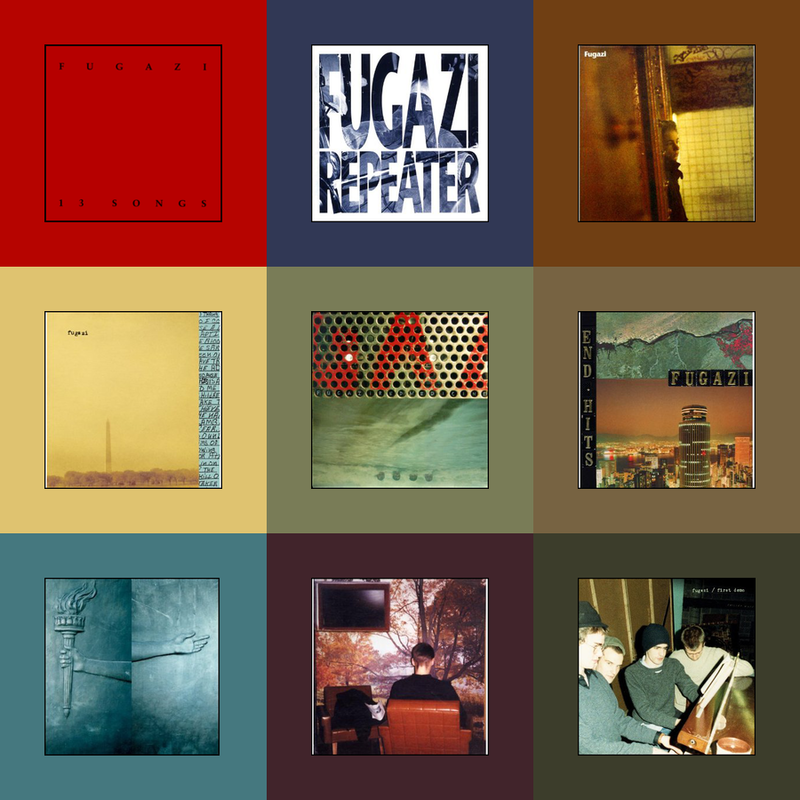 Repeater was later bundled with 3 Songs), and excluding the Instrument Soundtrack, Fugazi’s playbook can be fully represented by nine albums, representing 93 tracks. Fugazi played all of their songs. With the exception to the opening (unnamed) track on The Argument, every song they released on an album or EP was played live. Of course, not all songs were equally likely to be played often. On average, Fugazi played each song 174 times. 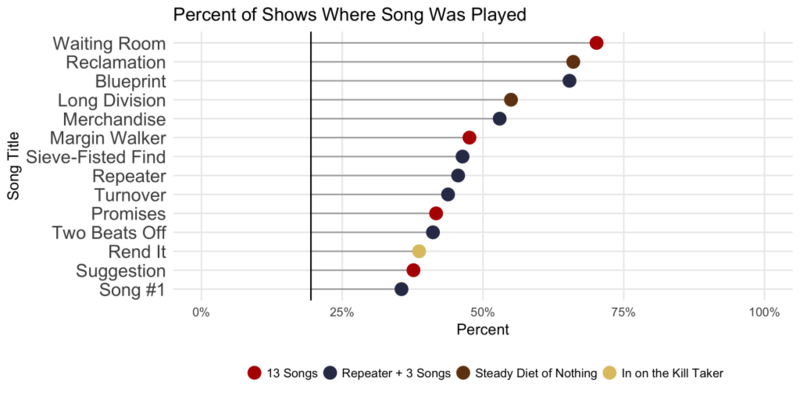 Put another way, each song was played at 19.4% of their shows. Naturally, some songs were played much more frequently, and many songs were played far less. 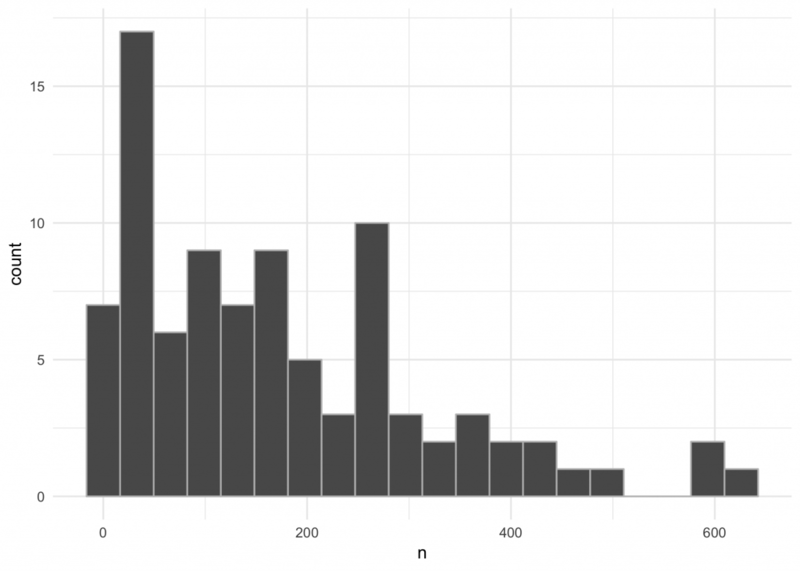 Below we show the distribution of song plays. The distribution is heavily skewed, with a many songs being played fewer than than 200 times and a few songs being played more than 600 times. In our next post, we’ll look at the songs individually to identify those most frequently played songs. Over the next few weeks1 I’ll be posting an deep-dive data analysis of Fugazi’s live performance history. Why? Why not. All the data is there and I was bored. I probably saw Fugazi perform a dozen times. Attending college outside of DC during the early ’90s made it easy. They played a lot, and famously never charged more than $5 for a show (and most of the time I saw them the show was free). I saw them in small venues and big indoor and in the shadow of the Washington monument. And they were never boring. Since 2011, Fugazi has made recordings of their shows available for download at https://www.dischord.com/fugazi_live_series. To date, playlists and recordings have been posted for 895 (85.4%) of all their shows. Across their entire career, Fugazi played 23,201 songs. In future blog posts, I’m going to analyze those performances. Again, for absolutely no good reason. One idea that I had for the analysis was to use the dominant album colors for the visualizations. I’m not sure that’s actually going to work because several of the albums used very similar palletes (they certainly seemed to have liked their olivey greens). But it resulted in a kinda cool image, nonetheless. I’m not sure why anyone would need or want it, but here’s my “Fugazi album color pallete” for reference. I placed fifth in a Kaggle competition. 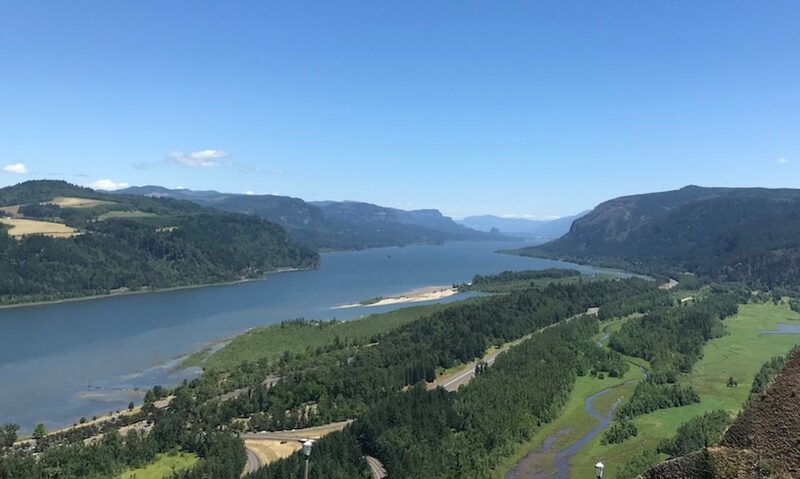 Seemed like a good time to finally start the blogdown blog I’ve been thinking about for a while. So here it is.